The on-going debate over the insufficiency of hydro-carbon based fuels and, the poor economic sustainability of their use has brought the question of every country's energy dependence to the forefront. Slovakia is one of the forested countries where the use of biomass and firewood is the ideal route towards energy independence as the use of forest products supports local industry, lowers energy costs and is a way of life that is more in touch with nature. We can therefore compare a number of fuels out of interest and the desire to improve opinions. The quantity of energy obtained from 1 m3 of hard wood is about the same quantity of energy as from 440 kg of brown coal, 210 kg of butane or even 280 kg of black coal. As a society we use many categories of firewood that the customer selects exclusively or in part though his or her personal preferences even if such customer prefers comfort and the freedom from time constraints. 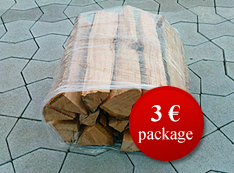 We offer split wood in two basic lengths: 33cm and 50cm, upon request we can provide any dimensions of split logs. 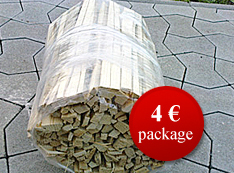 Our range of products is expanded to include wood for preparing meals, decorative wood for the fireplace and split soft wood for fire starting purposes. 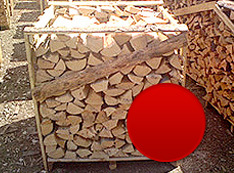 This type of firewood is intended for customers who prefer to process the wood themselves due to the benefits of lower cost yet more work involved; they need to have tools available and space available at home for this work and the risk of a serious injury is much higher. This product is a wonderful variant among the next two products as it only requires storage without any technical demands and does not present any injury risks; it is clean and comfortable with a friendly price. 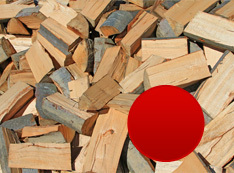 Split firewood stored on pallets is a very comfortable and compact method of storing wood. This product is best for long-term storage and simple manipulation, for example using a hand operated pallet jack, for practical storage near the heating unit. 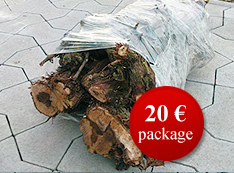 We also offer decorative split birch firewood in 12 kg packages. Thanks to it interesting colour and burn characteristics birch is a perfect decorative element for any fireplace. It makes for a wonderful fire with low ash; just the perfect fuel for a fireplace of woodstove. Enhance the originality of a winter evening! Wood from fruit trees and especially cherry trees is among the best wood for preparing food on a grill, spit or for home smoking meats, fish or cheeses where these all take on the unique aroma and taste without any bitterness. 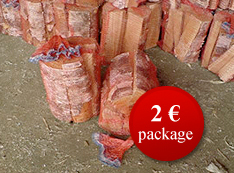 We offer cherry in packages of around 12 kg. Give your taste buds an experience as well! llow us to introduce you to an exclusive product dedicated for preparing foods: thick chunks of cut grape trunks; this ideal product is well known in Italian cuisine and it is sought after. 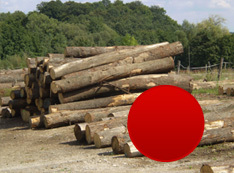 We carefully select extra thick chunks that we offer in standard lengths in packages of around 14 kg. Do you think the Italians don't know how to cook?